The Racing Series Elbe Line Up of JDM Wheels did not seem to be very popular here in the states, however in Japan, they seemed to have been more popular. The Elbe Racing Charge featured a 6 spoke face. The Elbe Racing Mesh II-R had a split spoke mesh style with hidden lug nuts and hex cap. The Elbe Racing Dish D8 had a short 8 spoke design, reminicent of Enkei Sporsh or Brabus III. The Elbe Racing Dish had a short square 5 spoke design. 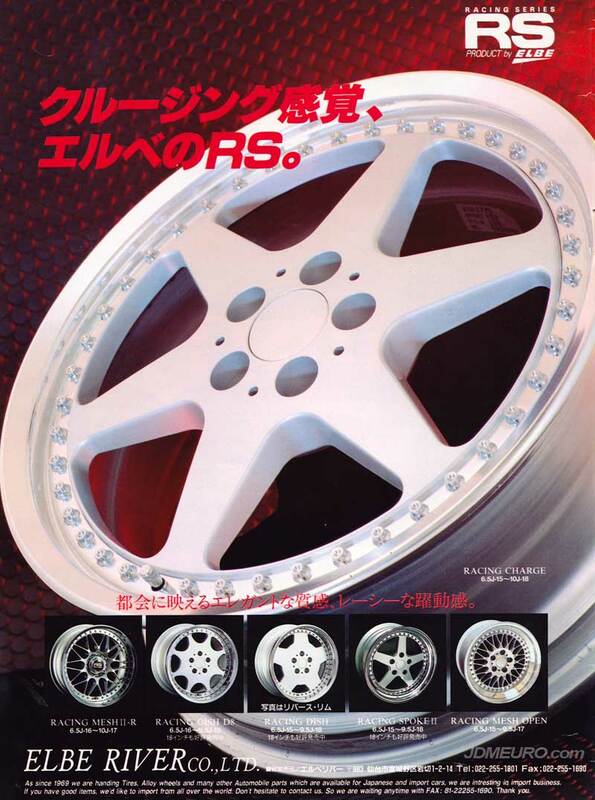 The Enkei Racing Spoke II has a classic 5 spoke design similar to Work Equip 05. The Elbe Racing Mesh Open has a classic mesh design with open lug nuts. All or the Elbe Racing Seies JDM Wheels shown here feature Multi Piece Construction.